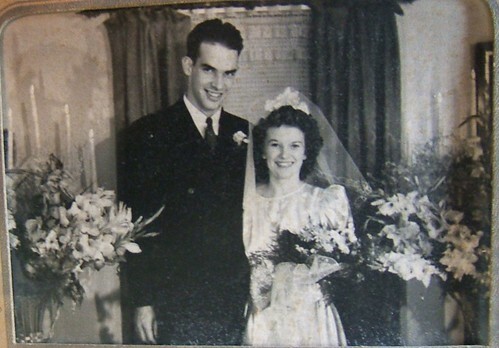 First, look how cute my grandparents were when they got married! The kid is with Grandma and the boy is in Japan so I am left to my own devices this weekend. I don't recall being home without anyone around for a whole weekend anytime in the last couple of years. It's kind of frightening how quiet it is. I find myself talking to my cats a lot. The cats just sort of look at me with what I think might be pity? Maybe I am just being paranoid. Anyhow, I am going to remedy this whole "alone" situation by having a sleepover at my friend's house this eve. In fact there will be a few girls there, it will be a full fledged pajama party. There will be fruity drinks consumed, a blender involved, PJ's, guitars and a lot of old movies that make girls cry. Speaking of Birthdays, it seems one of my favorite local bands is playing on my birthday! What good timing! you should totally be there! I just won't tell you how old I am going to be this year, so don't even ask. I think I know the answer. Is there a prize? I know the age answer! I was there! Suzy- There is a prize for NOT telling! Mom- if we get our stories straight imagine the possibilities! Cool - I can keep schtum. I've got some fun stuff for you. I'll send it soon so it arrives in time. I know that age answer as our same age ! winks ! !